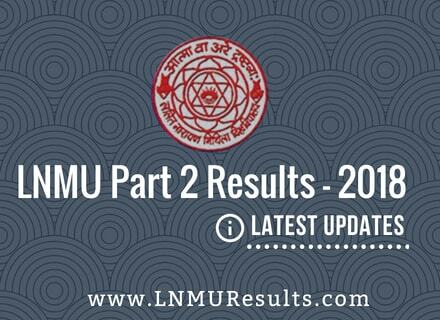 Looking for the updates on LNMU Part 2 Results 2018? Second-year examination of session 2016-2019 was conducted in the month of May 2018 and it was quite early compared to the last year in which Part 2 examinations were organized in the month of nov-dec. In this post, you will go through every single information you are looking for the LNMU Degree Second Part Results 2018. It usually takes LNMU at least 3 months to work on the results and publish it, so considering the examination period, which is May 2018, you can expect the results somewhere around Lat week of July or First week of August 2018. As you know examinations are being taken a bit of early in all the semester and final year examinations under LNMU Darbhanga, a speeder response of publishing the results can be expected from the University. In this post, you can stay yourself updated with the day by day updates with detailed reference and sources. LNMU Darbhanag is one of the popular universitiy of north bihar established in 1972. It has a big number of Constituent and affiliated in the 4 major distrcits of Northern Bihar that are Darbhanga, Begusarai, Samastipur and Madhubani. Students can pursue various Degree and Diploma courses from here. Before going further with anything, Let's have a look at the overall examination schedule of LNMU Part 2 Examination 2018. As you know, from this year University is taking the Practical and Viva Examinations before the main written examination and it's kind of a good thing for students as after the main written examination, as earlier there was no certainty on the schedule of Viva and practical examinations. This year, the online application was started in the month of April from 13th and was ended in the last of the month. Written exam was taken from 10th May. Admit cards were available to download 4-5 days prior to the first examination date. But still, that's just an expected and a kind of experience we have got so far with the LNMU Darbhanga. This section is especially for the day by day updates on the upcoming Lalit Narayan Mithila University second year results of B.A, B.Com and B.Sc. Results are expected to be live in last week of July 2018. But still, it's just a prediction and we will keep you updated with the latest news and announcemanets. Till then, have patience and Best of luck !!! Update - 4th August - Looks like there will be a slight delay in the publishing of Degree Part 2 Results as there are no expected dates mentioned in any of the news reports. We will update ths post whenever we will have a new one! Update - 12th August - Okay, so a kind of big update related to second year results. University has released special dates for those part 1 and part 2 candidates who missed their practical exams for some reason. In a recent news published in the newspaper, the examination is being conducted in August on a number of dates. Update: 1 September 2018. - Okay guys, so the wait is over. University has finally released the Second Part Results 2018. Students can check it from the link given in the table and more information on this will be updated shortly. Good luck with your results! So, the conclusion is that there should be a delay in the part 2 results of LNMU as results of these lately conducted practical exams may also be included. Whatever happens next, Just stay with us and we will keep you updated. Most of the students have always issue in checking the results by their own device. Don't worry, here's the solution. In case you don't know, how to check the results, don't worry at all. Follow the below steps and check your results very easily. Noe click on the Click Here for UG Part II Result button. A pop-up window will appear asking you the Roll no./IDR no. Enter your Roll no./IDR no. and click on the submit button. In case you are having any difficulties with the steps, kindly drop a comment and I will surely get back to you with the required help. This post will be updated very often so that you can have the latest updates time to time. If you are looking for something else in the LNMU Degree second year results, feel free to ask them in the comments. Also, feel free to share this post with your second-year mates, so that they can get the latest updates on results too. B.com part2 ka promoted result kab nikega sar jee .